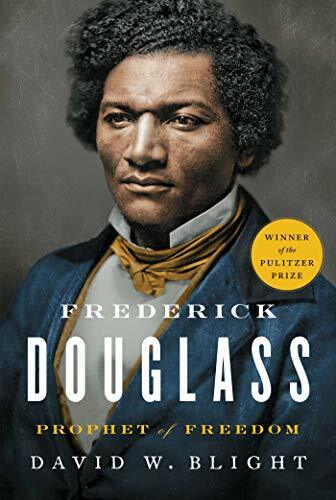 David W. Blight’s Frederick Douglass: Prophet of Freedom represents a remarkable work of research that not only captures the events of Douglass’s life, but brings to life the eras in which he lived. Through Douglass, Blight tells the story of nineteenth-century America, its triumphs and failures, and situates Douglass and his confidants within a literary tradition including Mark Twain, Walt Whitman, Charles Dickens, and Goethe. Blight “seeks Douglass’s complexity in all its forms, but never sidesteps his essential radicalism in a search for heroes we can hold dear and in common” (pg. xvi). Blight writes, “Few Americans ever more publicly and vividly remade themselves over and over quite like Douglass, and few had deeper reasons to try” (pg. 16). In terms of these changes, Blight examines Douglass’s politics, writing, “Two contradictory themes run through all of Douglass’s rhetoric regarding the Republicans. He demanded adherence to abolitionist principles; the free-soil position, therefore, offered him little immediate satisfaction, even as it provided hope of thwarting slavery’s future. But simultaneously, he found it impossible to resist the appeal of a broad coalition that could discredit slavery” (pg. 274). In acknowledging the radicalism of Douglass, Blight writes, “During the 1850s, as Douglass moved toward at least open support of violent means, the two abolitionists spent many hours and days in each other’s company. As Douglass came within John Brown’s orbit of religious fervor and theories of violent resistance, Douglass listened even as he was sometimes repelled” (pg. 281). As the Civil War began, “Douglass seized the moment with a fervor as great as any other in his career. To him the central meaning of secession and the coming of the war was that it raised at least the possibility of ‘armed abolition,’ of mingling the cause of the slave and the rights of free black people with the life of the nation” (pg. 340). To that end, “Douglass advocated a gallant rush of black men into uniform; they were now shining symbols, liberating warriors who alone made suffering meaningful. Transforming this conflict into a black peoples’ war demanded such great leaps of faith, even as sober history in retrospect tells us that sweet reason, moral truth, and blood sacrifice by themselves have never defeated racism” (pg. 395-396). Finished this thanks to a second library checkout and some recent time on a plane. And it was absolutely worth those 912 pages for the comprehensive overview not only of Douglass's fascinating life but of the period and the very fraught courses of abolition and reconstruction (both of which are commonly defined to sound like contained processes, and both of which were anything but). Blight paints a thorough picture of the politics of the day—not simple, to say the least, but really worth taking the complex, deep dive. I'd venture to say that there's really no way to drive home the nationwide (and beyond) horror of slavery and the multiple ways it was embedded in the culture, economy, and political and personal life of the day without going into that kind of depth, and even if Blight waxed a little purple here and there, it was overall a very nuanced, empirical examination of a hugely knotty movement. I came out of this enormously well informed about so many facets of abolition—just the factions within the Abolitionist movement alone were eye-opening—and I highly recommend this. Plus for once I'm right on the literary prize trend—this just won a Pulitzer and a Bancroft (and a Christopher) prize. I finally finished [Frederick Douglass: Prophet of Freedom] thanks to a second library checkout and some recent time on a plane. And it was absolutely worth those 912 pages for the comprehensive overview not only of Douglass's fascinating life but of the period and the very fraught courses of abolition and reconstruction (both of which are commonly defined to sound like contained processes, and both of which were anything but). Blight paints a thorough picture of the politics of the day—not simple, to say the least, but really worth taking the complex, deep dive. I'd venture to say that there's really no way to drive home the nationwide (and beyond) horror of slavery and the multiple ways it was embedded in the culture, economy, and political and personal life of the day without going into that kind of depth, and even if Blight waxed a little purple here and there, it was overall a very nuanced, empirical examination of a hugely knotty movement. I came out of this enormously well informed about so many facets of abolition—just the factions within the Abolitionist movement alone were eye-opening—and I highly recommend this. Plus for once I'm right on the literary prize trend—this just won a Pulitzer and a Bancroft (and a Christopher) prize.